I love imagination. I particularly love the kind of imagination that goes into delightful ideas like this one! This little dude, known as Le Petit Prince (in a cutesy reference to Antoine de Saint-Exupéry), is an ingenious solution to what may someday be a genuine problem. Earth is getting crowded, with a population of over 6 billion. Science fiction authors have been writing about the possibility of colonising other worlds for a long time now, but in perfect honesty, it’s a logical conclusion to make if the human population on our planet is going to keep growing. And Mars, being relatively hospitable, is probably one of the most obvious places to move to. But the thing about Mars is that it recieves less insolation. Sunlight is that much weaker out by our butterscotch coloured neighbour world that some plants may have difficulty getting enough sunlight to survive. Wouldn’t it be helpful if plants could walk to sunnier locations? Well, with little gadgets like this guy, maybe they will. 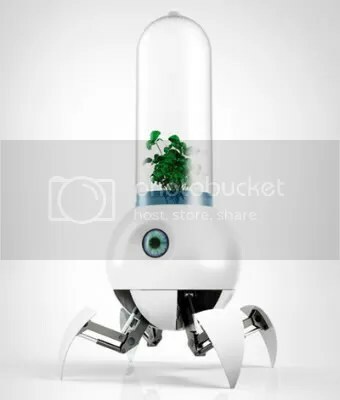 Le Petit Prince (looking a lot like something which might be manufactured by Aperture Laboratories) is intended to wander the martian surface, looking for both sunlight and nutrients to keep the growing conditions optimal for it’s leafy passenger. A swarm of these robots could then keep in touch wirelessly to map out the best places to grow. And frankly, the idea of a herd of robots roaming across the plains of Mars is just such a lovely idea. 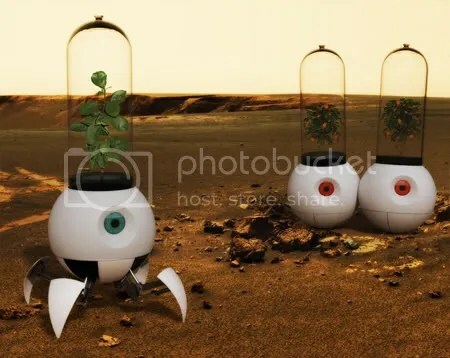 The intention is that, as well as acting like a life support system for a plant, these little mobile greenhouses are also intended to act as a kind of robotic pet for early martian colonists. Actually, I’d love one as a pet myself. They’re really cute! This entry was posted in space, Tech and tagged mad science, mars, planets, robots, space exploration, spaceflight, technology. Bookmark the permalink.